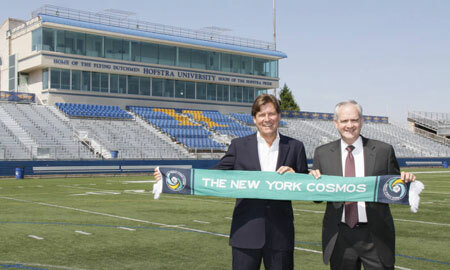 The New York Cosmos announced on Tuesday morning that they have reached an agreement with Hofstra University and will use James M. Shuart Stadium in Hempstead, Long Island as their home venue in 2013 when they start play in the North American Soccer League. Hofstra was once home of the original Cosmos in the first incarnation of the NASL who played there from 1972 through 1973. Hofstra Stadium is a 13,000 seat multi-purpose stadium. Its dimension are 128 x 76 yards but the Cosmos front office told IMS today that they are still unsure of the exact dimension the team will use next season. Hofstra cut their football program in 2009 but the stadium still has football lines and end zones cut into the turf surface along with lacrosse and soccer lines. The Cosmos would not comment at this time on the gridiron lines and if they had plans to deal with those. O’Brien told Michael Lewis of Newsday, “I come from a very conservative business side. I want to fill it, but we haven’t set our business plans on filling it because we’re realistic. We’ve got to earn the respect of the fan base. Having not played for 30 years, it would be arrogant beyond belief to just turn up and think that people are just going to fill the stadium.” O’Brien said he expects that core of that fan base to be from Long Island. Tuesday’s press release states that the Cosmos anticipate releasing details of their 2013 match schedule and ticketing information at the end of October. The timing seems to match the NASL Board of Governors meeting which will be held the same weekend of the 2nd leg of the Soccer Bowl Championship on October 27th. O’Brien also told Lewis that he hopes to have a coach and general manager named by that late October date. “We’re in final stages of negotiations with parties,” said O’Brien.